Carte Fini is very excited to welcome back Ms. Tiffanie Turner of papelsf and corner blog with a spectacular creation that is an absolute delight and wonderful way to usher in this new season….thank you Tiffanie for your artistry, your splendid presentation! Hi everyone! I am so happy to be back as Carte Fini's featured artist, sharing a project that is very close to my heart. I created these "closed" peonies as part of my giant paper peony piñata tutorial last year. There was one innocently hanging in a tree with the other larger, more open peonies. When wedding season arrives, everyone should have some giant flower love hanging at their next party.....or wedding! Great peony colors include from left to right: #570 (pink suede), #548 (baby pink) and my new favorite #577 (french vanilla). For center stamens try #566 (lime pulp) or #576 (goldenrod). It really is a spectacular piece when it is finished, isn't it? This one measures 24" across by 13" deep, but it is very easy to go bigger or smaller, just by enlarging or reducing your base and petal sizes. *NOTE: We apologize that the actual tutorial instructions have been removed at the request of the artist. We hope to have them available again in the future. Pretty flowers, too bad the original author removed the instructions. This diy project is absolutely a work of art. How did you come up with this paper pony idea ? Your pioni is beautiful, I wanted to get a textbook, if necessary, for dengi. Maybe you should take the pics down if they are not available as tutorial! Hello Tiffanie, Would you please provide tutorial. I have wanted to make this peony for several years. Bought all the supplies and then Carte Fini removed the instructions. THANK YOU! Sorry sent wrong email in post earlier..
Do you manufacture these giant paper peonies for sale? If yes what would be the cost each? I cannot find the tutorial for the giant peony! Please share! I am wanting to make these for a gathering of cousins for lunch and tea at the end of the month. This will be a fabulous decoration! Thank you so much! Beautiful flowers, please email me the tutorial I’d love to make these! Stunning!! Is there a tutorial anywhere? These look so beautiful. Can you re-post the tutorial? I would love to try & make one or two of these. Is it possible for you to share the tutorial? It is no longer available at Tiffanie’s blog. Thank you so much. Simply gorgeous! Cannot seem to find the tutorial to make these beauties though. There are 2 weddings coming up within my family that could really use these gorgeous creations! 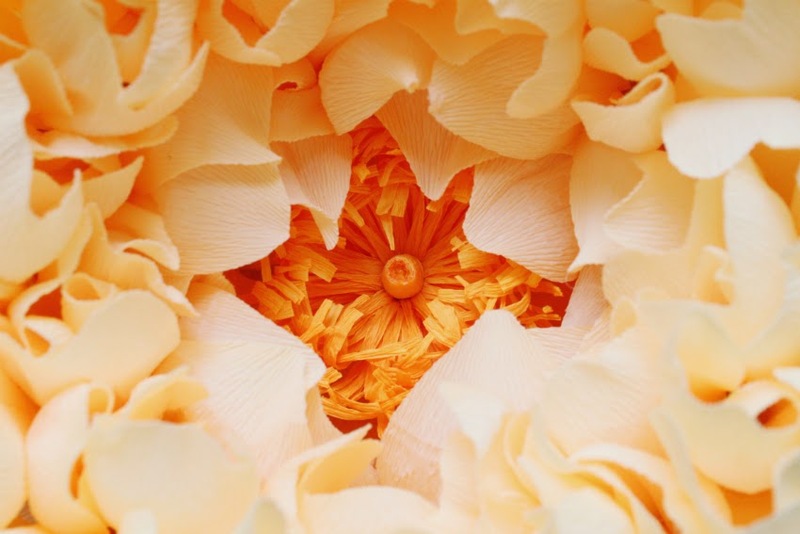 Please share how you made these stunning flowers. The peonies are beautiful. Is there a tutorial for them? Thank you. I can’t see your pictures please update them? Is this tutorial still available? Where can we find the video at? These are beautiful and I would love to see how you created them! Hey! Beautiful flower! Is the tutorial available anywhere? The link above doesn’t lead to it anymore. Hope to hear from you soon. Thank you for these amazing flowers and for this DIY ))) I have made my peony folowing all steps and its gorgeous, i loved it and you know its not so difficult to do ))) So hope everybody try it !!! I love this idea. 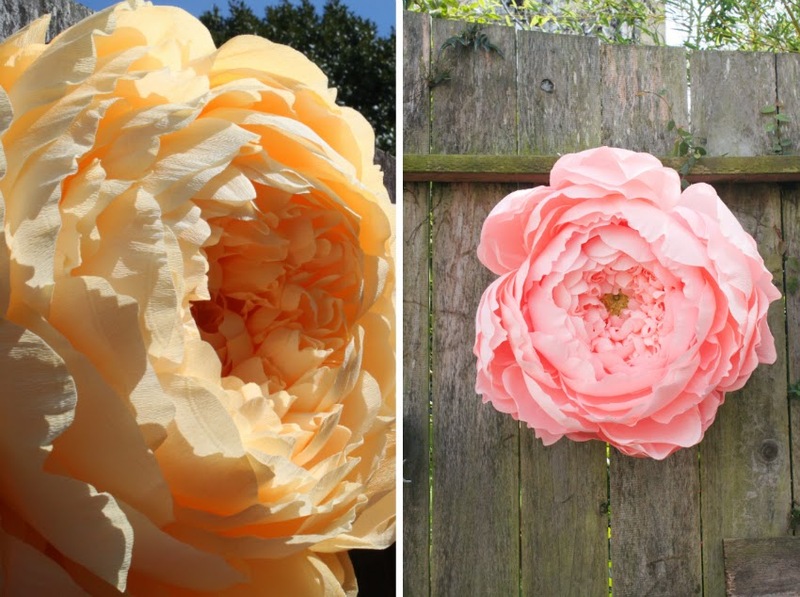 I was wondering if you could use the bottom part of the balloon papier mache form, insert a pole or pvc pipe, etc and create a stem for tall standing peonies. Maybe slit the side, insert bottom, hot glue in place, then use duct tape or needle and thread to seal the sides closed at a slightly smaller circumference. Also, since I’ve never worked with paper mache, could you make the form, use some kind of sealant and then paper mache over the form. Or, is it better to go with the balloon every time? this is awesome … thanks for the tutorial. am doing it for a wedding on august….they are beautiful… i will mention your name. 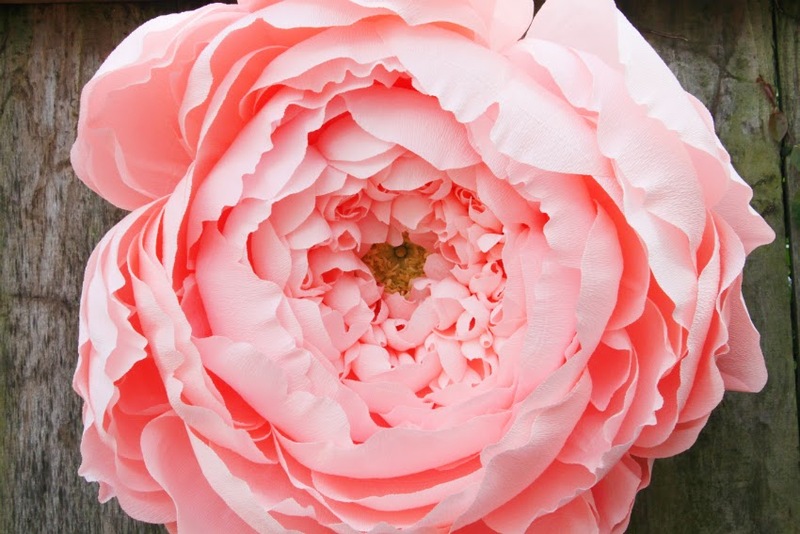 I love your giant peony! It’s beautiful and so realistic. 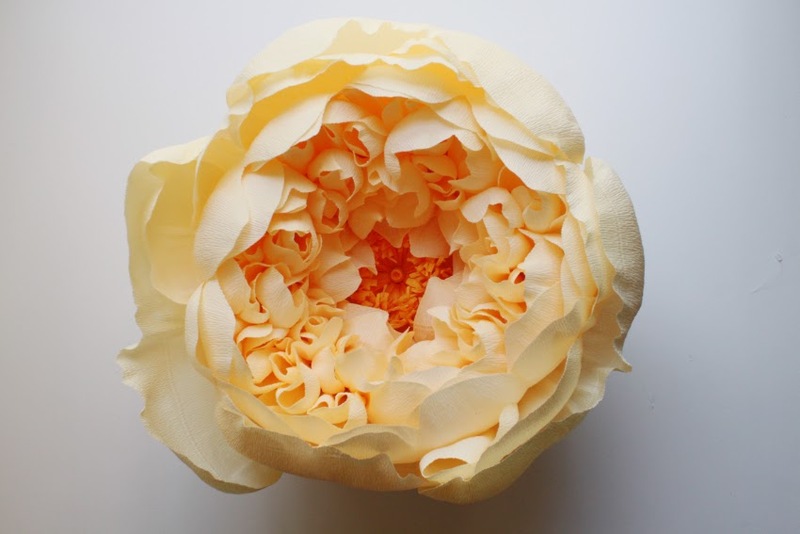 I’d really like to make a regular sized peony using your technique—any idea what to use instead of the balloon mold? I can’t think of anything that has this shape but smaller. Maybe a large bottle cap? Oh*My*God – utterly, utterly stunning. Tiffanie you are such a inspiration. Thank you for sharing your knowledge and creativity. These are absolutely STUNNING! 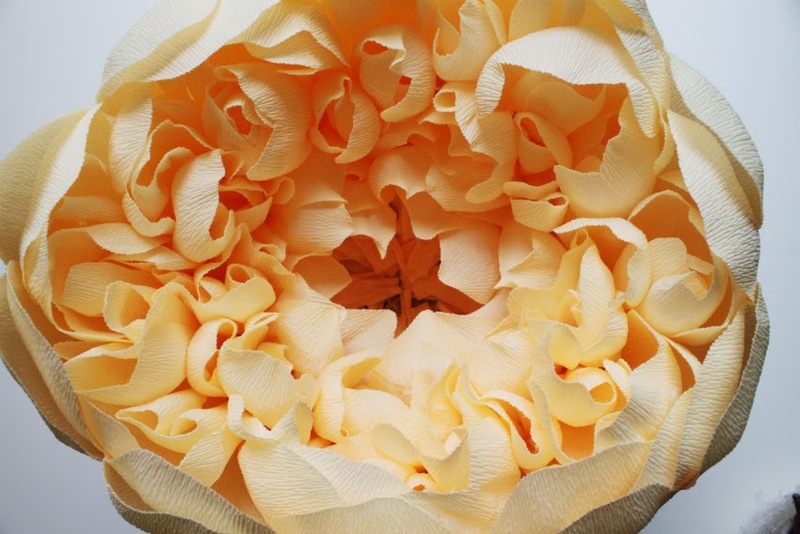 I spent a while last year looking for crepe paper flower tutorials for my wedding. 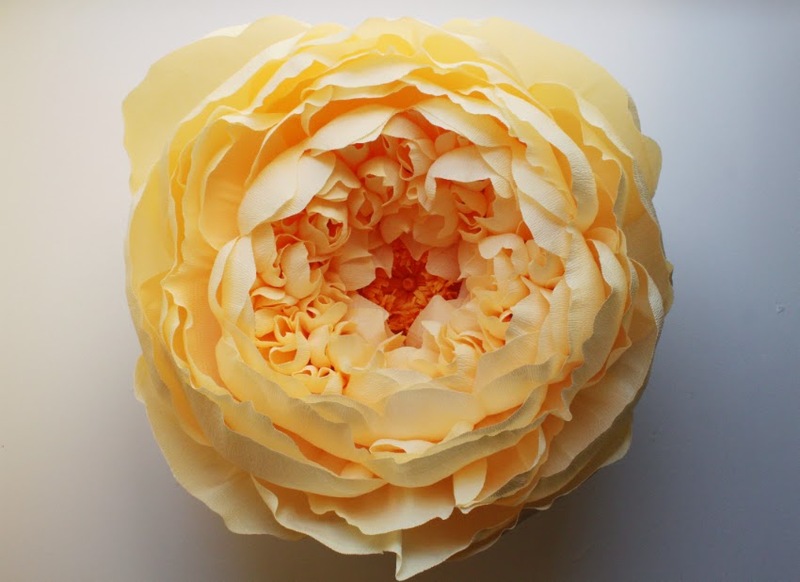 (I spent ages looking for large scale paper flower tutorials like this one!) I never found what I was envisioning; instead, I ended up making crepe paper rolled rosettes and affixing them to styrofoam balls, and hanging them by ribbons from the reception tent – sort of like a pomander. However, I am definitely bookmarking this tutorial, as I am sure I can find a use for this project at some point later on, since our wedding day has already happened :) Thank you so much for sharing this detailed DIY! Jessica: I hope they came out well, please send photos! Jesus: Thank you so much! Dani, Rita and Nan: Thank you, it means so much to me. Candacde: Yes, 4-5 rolls but that is not much considering the impact they make, for sure. Aleene: You can purchase a curler from Carte Fini for some phenomenal results, but for this tutorial I just pull the very edge of the paper quickly between my fingers and it forms ruffles. Otherwise, at the interior it is all about how you form and stretch the crepe paper. Christie: I think you would use a smaller balloon, and just scale the petals down, and you’ll do fine! I have 3 rolls of crepe paper. How can I scale this down so that it only needs 3? Hi I want to take a class online, when do you have the next class??? Amazing flowers! They’re so delicate and incredibly detailed. 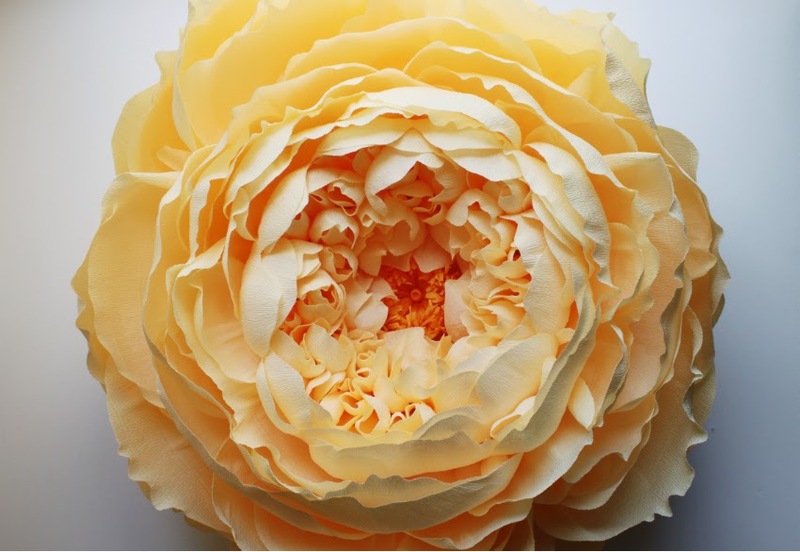 How do you curl the petals? By using a curling machine or by hand? 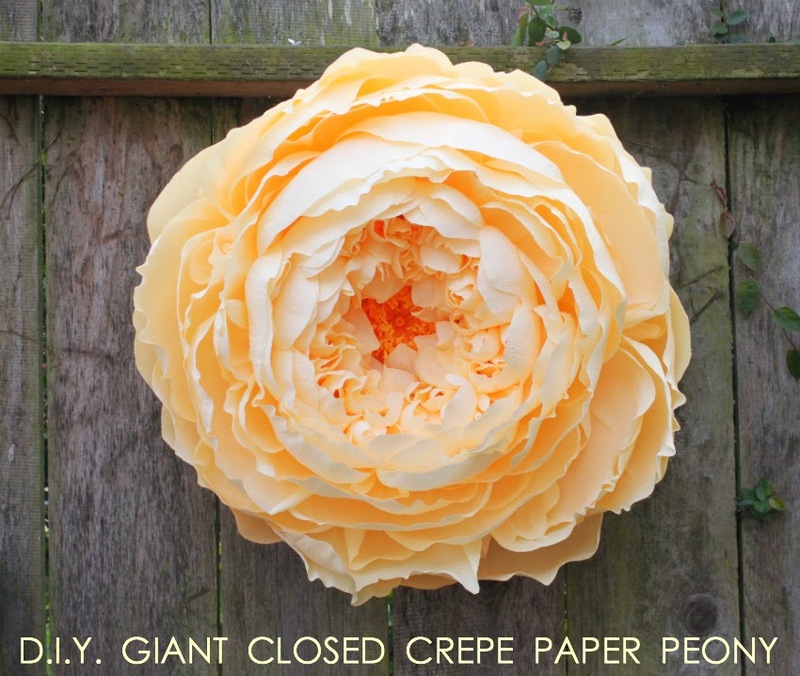 You need 4-5 rolls of crepe paper for each flower? That makes these pretty pricey, but I guess they’re so big that only a few would make a huge impact. Ooh, what a fun project and with beautiful results. Must try soon. These flowers are simply stunning! So beautiful! This would be a beautiful as a background to a wedding ceremony. Beautiful! I ordered the supplies to make a couple of these, we are installing some panels of paper flowers in our church commons area for Easter Sunday, this will be a beautiful addition. Beautifully done! What craftsmanship and technique!